A bowl of oatmeal used to be considered a rather boring breakfast choice, but that’s not the case anymore. Research finds that oatmeal sales (by unit) increased in 2017 by 1.7 percent. Not too shabby for a food category that’s been around for thousands of years, according to a history report published on KRCU. And it’s a change in the right direction because, in their original form, oats are are 100 percent whole grains and provide heart-friendly soluble fiber. Part of that uptick may have to do with interesting options currently filling market shelves. Many of them are fast to fix for busy folks. 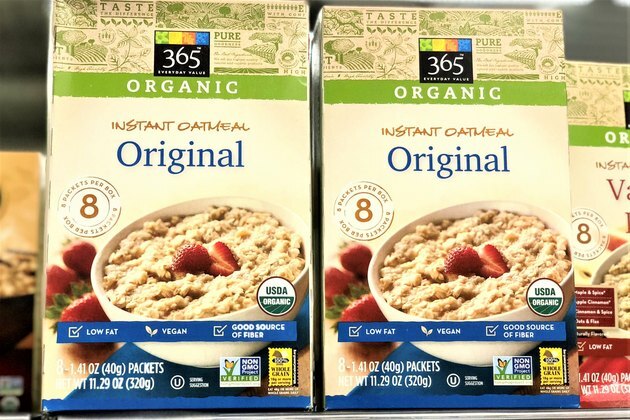 But before you buy your next packet or container, you do need to discriminate when it comes to instant oatmeal. Some instant oatmeals are loaded with added sugars and contain artificial or other highly processed ingredients that make many of them a not-so-healthy choice. 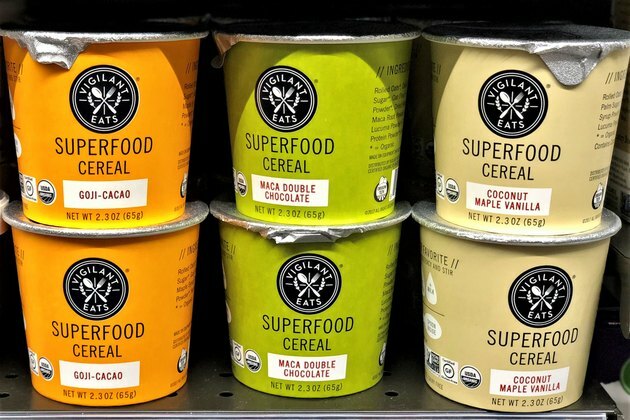 We’ve sussed out 9 brands and determined which ones to avoid and which ones to throw in your grocery cart so you can have a nutritious, tasty and quick whole-grain breakfast in just a couple of minutes or less. It’s a fact that buying store-based brands can save you money. But in this case, it’s not worth the savings. When you look at the nutrition facts panel for Kroger Raisin, Apple & Walnut Instant Oatmeal, it may look like a relatively healthy pick because of its six grams of fiber and only three grams of sugars. But the nutritional issues with this particular oatmeal are not based on what’s found in the numbers, but rather what’s discovered by reading the ingredient list. This oatmeal contains dehydrated apple flakes that have been preserved with sodium sulfite and sulfur dioxide. Besides the glaring fact that no body needs sulfites, a small percentage of the population is considered sulfite-sensitive and may have skin, stomach or respiratory reactions after ingesting it. The walnuts contain butylated hydroxytoluene (BHT), which is a preservative “generally recognized as safe” (GRAS) by the government, but some research has shown it to cause cancer and thyroid issues in animals. Lastly, this breakfast meal contains sucralose, an artificial sweetener that may contribute to fat buildup in cells, according to Science Daily. Final verdict? Skip this purchase. Nutritional Info: One packet of this oatmeal provides 150 calories, 180 milligrams of sodium, six grams of dietary fiber, three grams of total sugars and four grams of protein. Read more: How Much Oatmeal Should I Eat for Breakfast to Boost Metabolism? If you need (or just want) to go gluten-free, Glutenfreeda typically has tasty options that will satisfy your morning oatmeal fix. This oatmeal is made with certified gluten-free oats, contains healthy flax and can be prepared in an instant. Unfortunately, that’s where the good news ends. The sweetness in this morning meal comes from the massive amount of brown cane sugar added to its ingredients. By weight, it has more added sugar than either the freeze-dried strawberries or freeze-dried wild berries in the cup. In fact, 13 of the 15 grams of sugars are from added sugars. That’s more than three teaspoonfuls. If you are going to indulge in this sweet cup, know that it’s more like having dessert for breakfast. (However, if you are determined to indulge, at the very least you can feel good knowing there aren’t any preservatives, artificial ingredients or genetically modified organisms (GMOs)). Nutritional Info: One cup of this oatmeal provides 280 calories, 110 milligrams of sodium, six grams of dietary fiber, 15 grams of sugar and nine grams of protein. 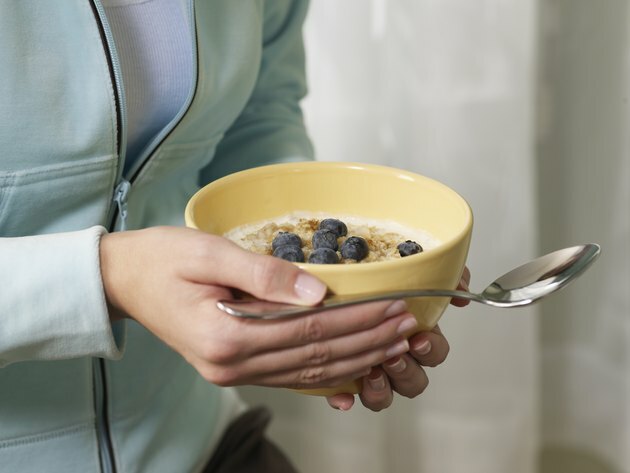 Read more: Does Old-Fashioned Oatmeal Contain Gluten? This oatmeal starts off promising. ThinkThin Protein & Fiber Hot Oatmeal — Honey Peanut Butter flavor begins with a whole-grain blend of rolled oats, steel-cut oats and red quinoa, but that’s where the goodness ends. The 10 grams of protein is mainly from a highly processed source, isolated soy protein, rather than a whole protein food source like whole soybeans or foods made with whole soybeans, such as soymilk or tofu. Additionally, there are a couple of different types of added sugars, such as dried cane syrup and honey powder. ThinkThin’s honey powder is a mixture of the powdery food additive maltodextrin and honey; it’s not like you’re getting drizzles of pure honey straight from the honeycomb in this packet. What’s more, most of the peanut flavor doesn’t come from real peanuts, but rather peanut drops, which are a mix of sugar, palm kernel oil, peanut flour, nonfat dry milk powder, salt and soy lecithin. In the end, you may be getting wholesome whole grains, but it comes with a heck of a lot of overly processed ingredients. Nutritional Info: One packet of this oatmeal provides 200 calories, 220 milligrams of sodium, five grams of dietary fiber, nine grams of total sugars and 10 grams of protein. Read more: Is Oatmeal a Good Breakfast for Weight Loss? Honestly, it’s challenging to find an organic oatmeal that we wouldn’t recommend. But this Simple Truth Organic Natural Maple & Brown Sugar Flavored Instant Oatmeal is the biggest loser. Its base may be organic rolled oats (a good thing), but the very next ingredient listed on the nutrition panel is organic dried cane syrup. While it may be less processed than white table sugar, it’s still 100 percent added sugar. And it’s not just a little bit of added sugar, it’s a lot. You’ll find nearly four teaspoons of total sugar in each package. Also, the name of this oatmeal is misleading. The package says “natural maple” as part of its flavor profile. Unfortunately, it only has added flavoring; there is absolutely no pure or natural maple syrup. Which is too bad, because the potential antimicrobial benefits associated with pure maple syrup is a good thing — but you won’t find any in this instant breakfast pick. Nutritional Info: One package of this oatmeal provides 200 calories, 180 milligrams of sodium, four grams of dietary fiber, 15 grams of total sugars and five grams of protein. Read more: How Many Calories Are in Pure Maple Syrup? For decades, Americans have been able to count on the Quaker Oats Company for the steadfast goodness found in its iconic canisters of oats. Quaker Instant Oatmeal Peaches & Cream, however, can’t hold up to the same nutritionist-recommended standard. While this breakfast option begins with healthy 100 percent whole-grain rolled oats and contains plenty of vitamins and minerals, such as iron and calcium, it also contains so many ingredients that any nutritionist would pass on these instant packets. There’s the creaming agent that reads like a pseudo-science experiment: maltodextrin, partially hydrogenated soybean oil, corn syrup solids, whey, sodium caseinate, sugar, dipotassium phosphate, mono and diglycerides, artificial color, salt, soy lecithin and artificial flavor. And to add insult to injury, there are no real peaches in here either. Rather, you’ll find artificially peach-flavored dehydrated apple pieces. Instead? Stick to just the oats and add your own fresh peaches. Nutritional Info: One packet of this oatmeal provides 130 calories, 180 milligrams of sodium, two grams of dietary fiber, 12 grams of total sugars and three grams of protein. Read more: Is Oatmeal a Healthy Breakfast? This morning bowl of plant-based goodness proves that you can get a delightful hint of sweetness naturally without all those added sugars. And not only is this oatmeal vegan, but it is loaded with good superfoods like cranberries. Cranberries are a potent source of polyphenols and may be beneficial in the prevention of obesity and related disorders. 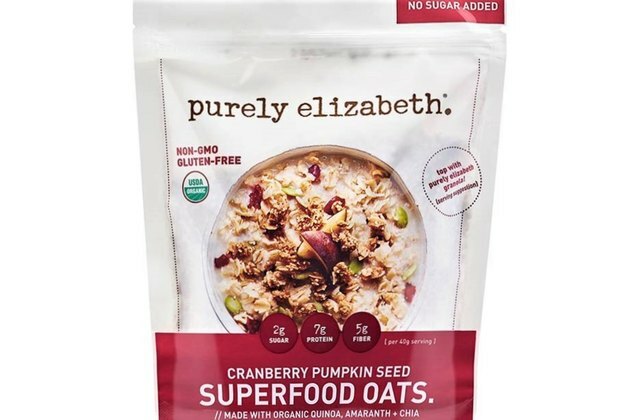 Beyond the dried cranberries, this oatmeal is also made with five other simple, 100 percent real, organic and non-GMO ingredients: gluten-free oats, raw pumpkin seeds, chia seeds, puffed amaranth and quinoa flakes. The combination results in a much-appreciated texture instead of the typical oatmeal mushiness. Another option we adore from this brand? Purely Elizabeth Vibrant Oat Cups that are flavored with golden turmeric, blue spirulina and pink pitaya. They’re slightly higher in calories and do have some added coconut sugar, but they're also loaded with antioxidants. Nutritional Info: Each serving of this oatmeal provides 160 calories, zero milligrams of sodium, five grams of dietary fiber, two grams of total sugars and seven grams of protein. 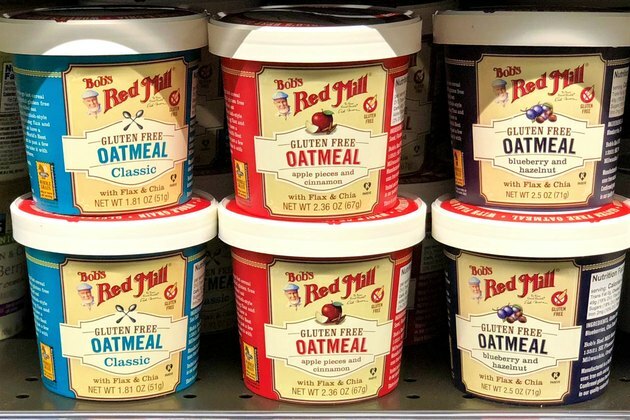 If you want a simple instant oatmeal in a cup, Bob’s Red Mill Gluten Free Classic Oatmeal Cup with Flax & Chia is a fantastic pick. The chia seeds and flaxseed provide a nutritional bump and textural interest. The double whammy of seven grams each of dietary fiber (from the oats and the seeds) and protein will help keep you satisfied. Chia seeds have 10 grams of fiber per ounce; flaxseed has 8.5 grams of fiber per ounce. And both provide heart-healthful omega-3 fatty acids. This oatmeal is an excellent choice as a certified gluten-free option or a speedy vegan entree. And dressing up this plain Jane is easy enough. Add a tablespoon of almond butter and sprinkle with sliced strawberries and toasted sliced almonds. The almonds pump up both the plant-based protein and fiber even more, and you’ll get a satisfying crunch. Nutritional Info: One cup of this oatmeals provides 210 calories, 160 milligrams of sodium, seven grams of dietary fiber, one gram of total sugars and seven grams of protein. Do you like your oatmeal to contain just USDA certified organic rolled oats and nothing else? Then the original version of 365 Everyday Value Organic Instant Oatmeal is the oatmeal for you. That means you’ll get every benefit associated with oats, including the beta glucans (a form of soluble fiber), in a breakfast that may boost your immune system and help fight bad bacteria, viruses and more. You can also feel good about this instant pick because there’s no added sodium and no added sugars. And what’s more, it’s Non-GMO Project Verified and meets the Whole Foods Market 365 criteria for getting a sustainability badge, making it good food choice for the planet. Speediness and simplicity at its best. Nutritional Info: One packet of this oatmeal provides 150 calories, zero milligrams of sodium, four grams of dietary fiber, less than one gram of sugar and six grams of protein. Read more: Is Eating Uncooked Oatmeal Healthy? One of the coolest cups of oatmeal on the market is Vigilant Eats Maca Double Chocolate Superfood Cereal. Not only is it organic, it’s got some of the trendiest ingredients boasting superfood benefits. Cacao nibs contain cocoa polyphenols and can act as a powerful antioxidant. Maca root powder may play a role in enhancing fertility, and lucuma powder may have a beneficial impact on blood sugar. The only drawback is that this superfood cereal contains some added sugars. But don’t worry too much about excess sugar here; only seven grams of the 13 grams are from added sugars. Current health guidelines advise having no more than 25 grams of added sugar daily for women and 36 grams of added sugar daily for men. Much of the sweetness in this oatmeal occurs naturally from the dates. And one more fun thing: A spoon is included so you can eat your oatmeal on the run simply by adding cold water. Nutritional Info: One cup of this oatmeal provides 240 calories, 20 milligrams of sodium, 10 grams of dietary fiber, 13 grams of total sugars and seven grams of protein. Read more: What Are the Benefits of Eating Oatmeal Every Morning?